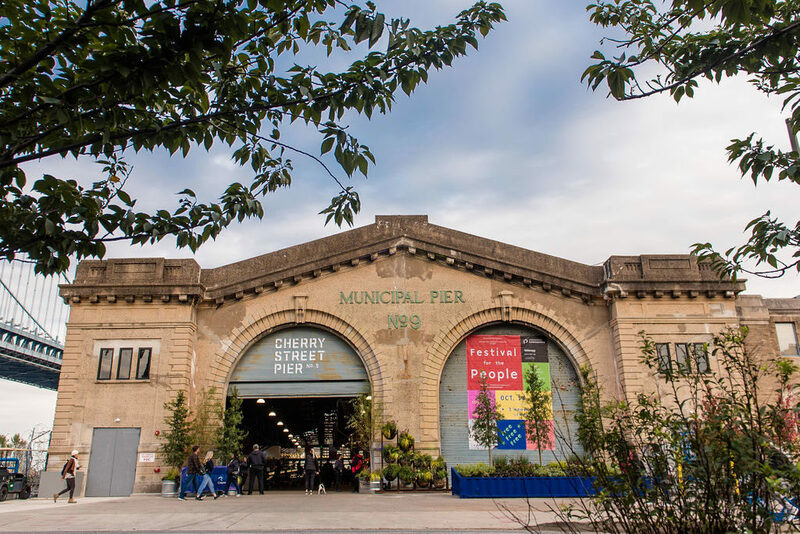 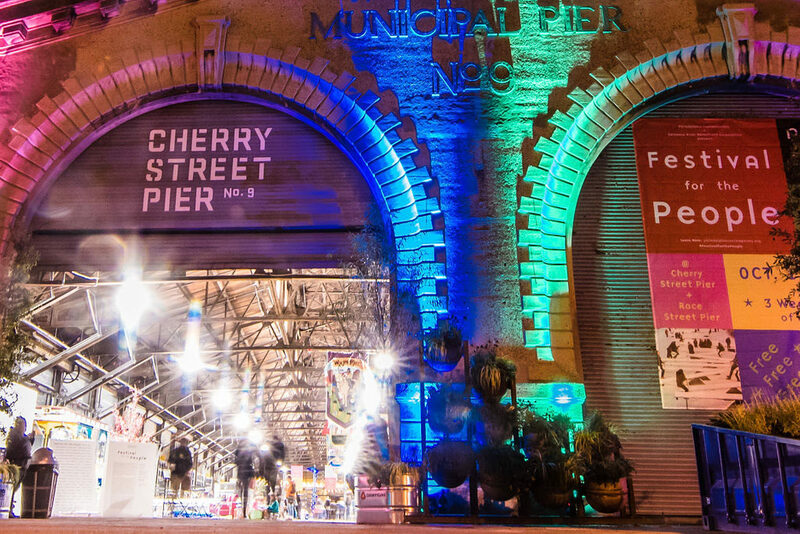 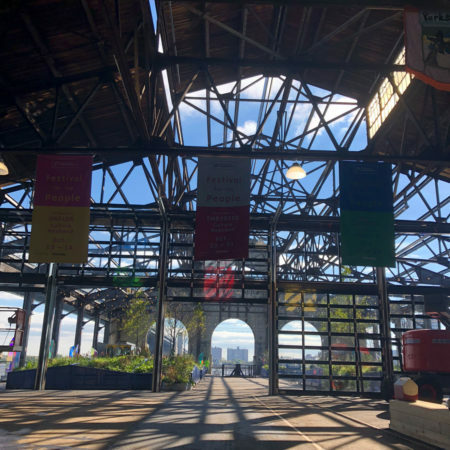 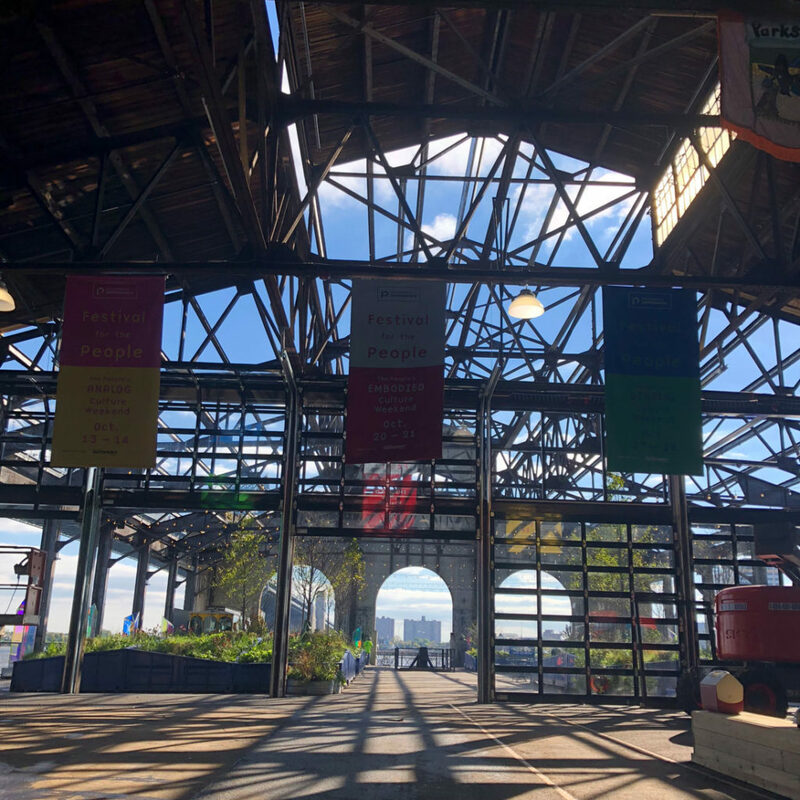 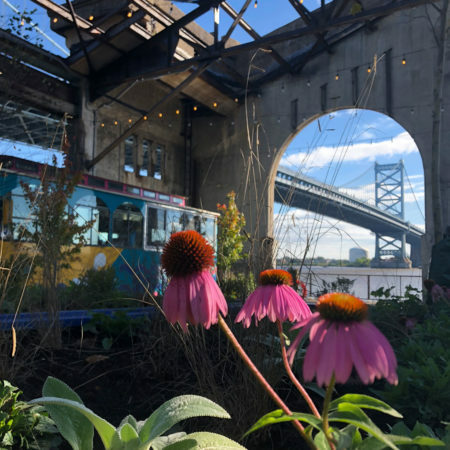 Cherry Street Pier (CSP) is an adaptive reuse project along the Delaware River Waterfront that sought to transform a disused shipping and transportation hub into a world-class waterfront amenity for the city of Philadelphia and beyond. 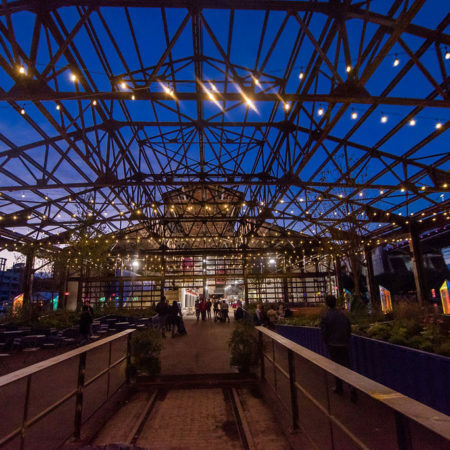 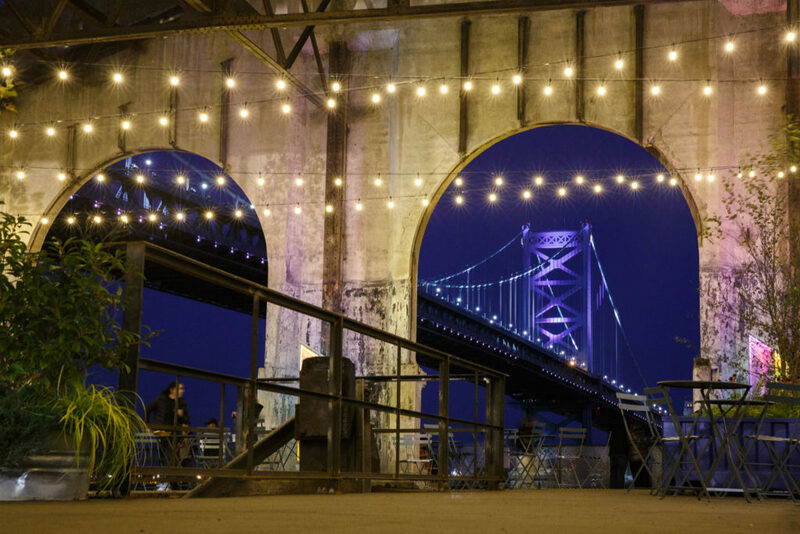 The design pulls inspiration not only from the pier’s industrial architecture, but also from Philadelphia’s historic and current role as a city of industry and makers. 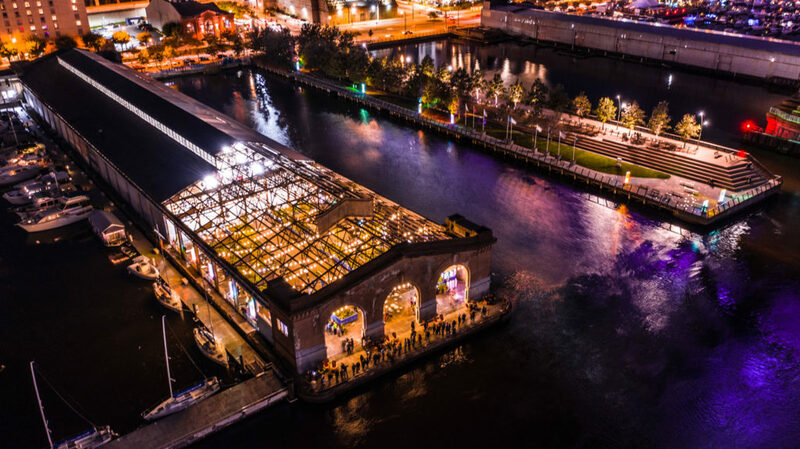 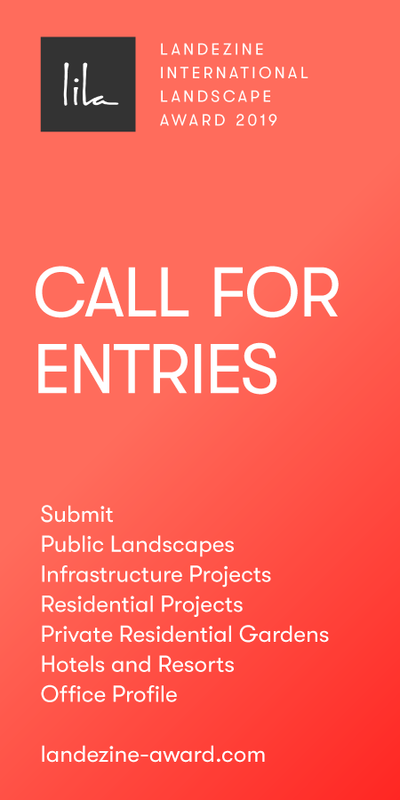 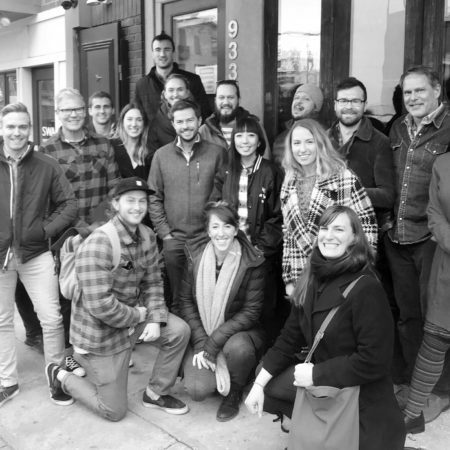 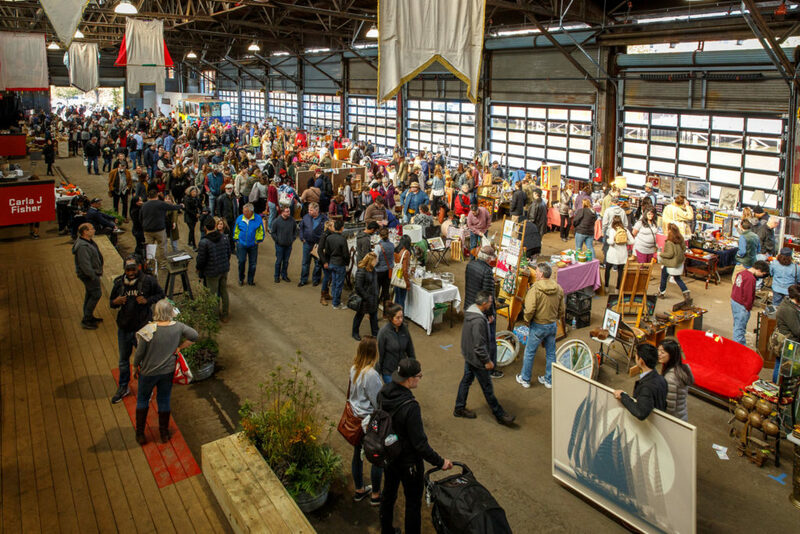 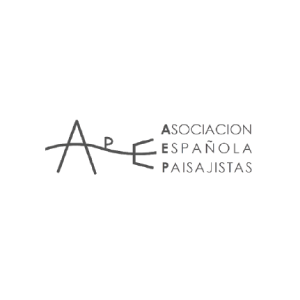 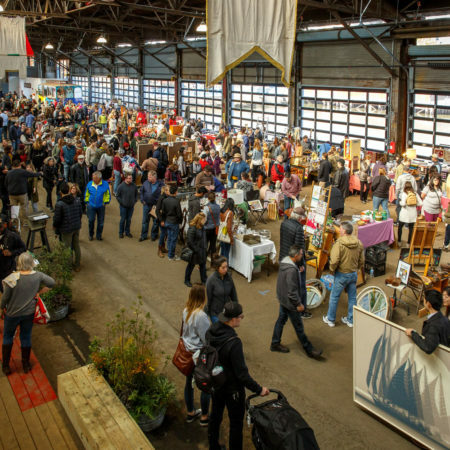 CSP is a multi-use project that serves as an arts/maker-space incubator, a public gathering space for markets and events and a public garden on the water. 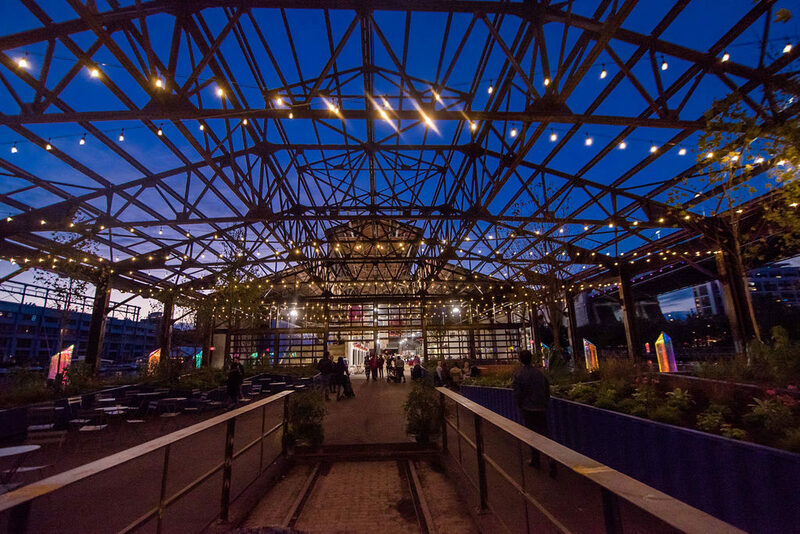 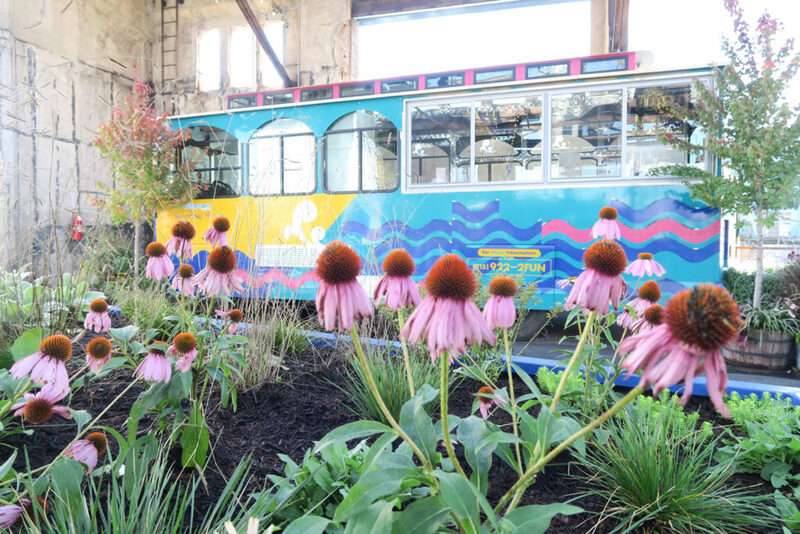 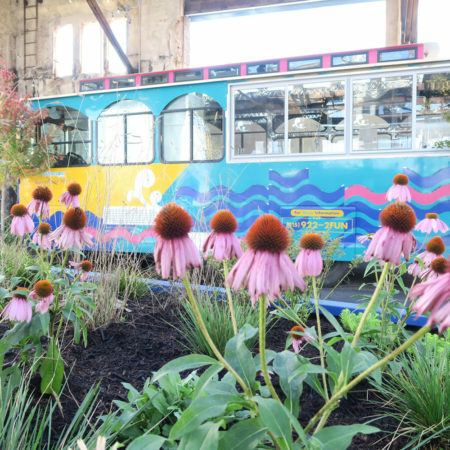 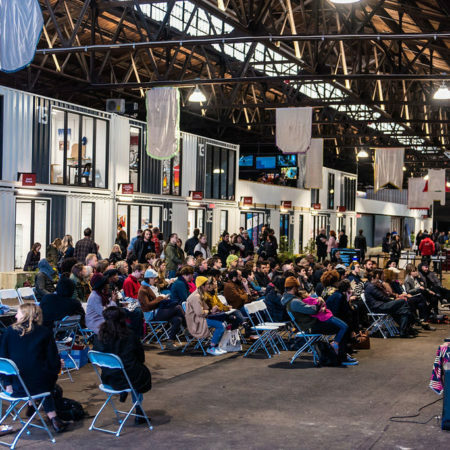 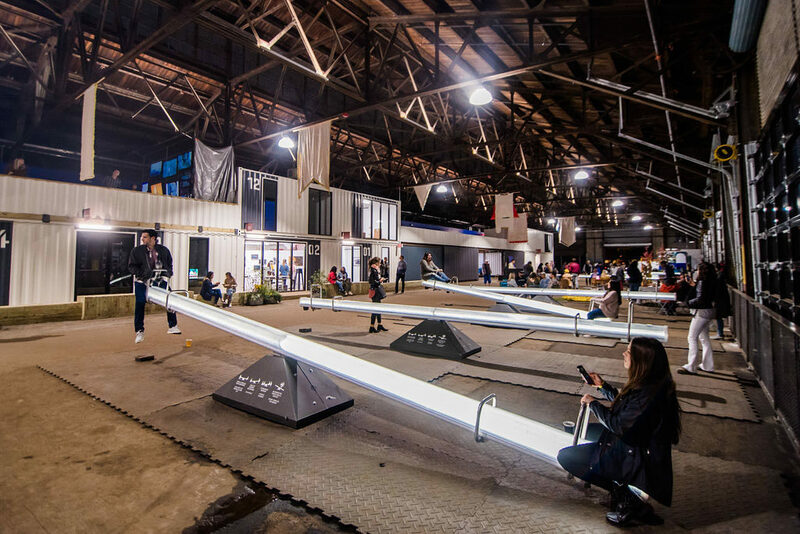 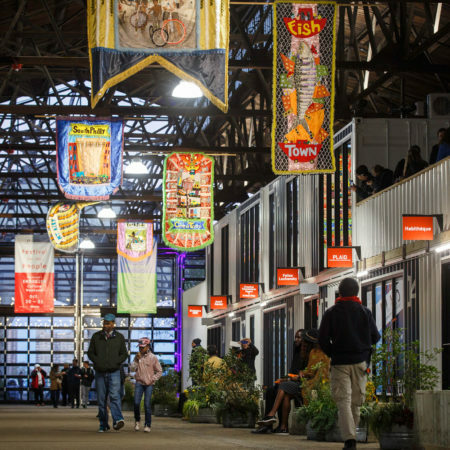 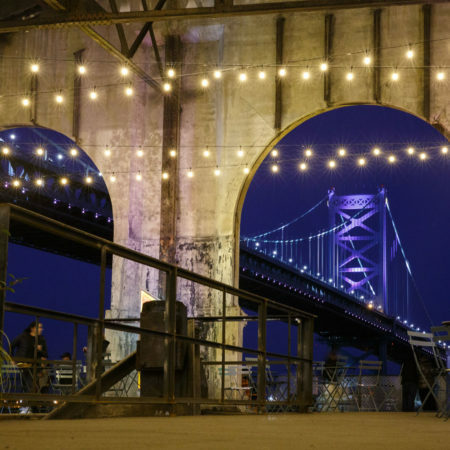 It is a unique space in the city, one that celebrates Philadelphia’s industrial manufacturing past while drawing it into a creative and community-driven future. 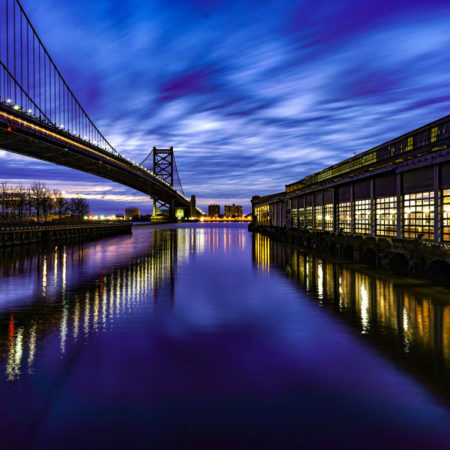 Pier 9 (as CSP was formerly known) was built in 1919 as part of a move to modernize the shipping industry in Philadelphia by accommodating more, and larger ships. 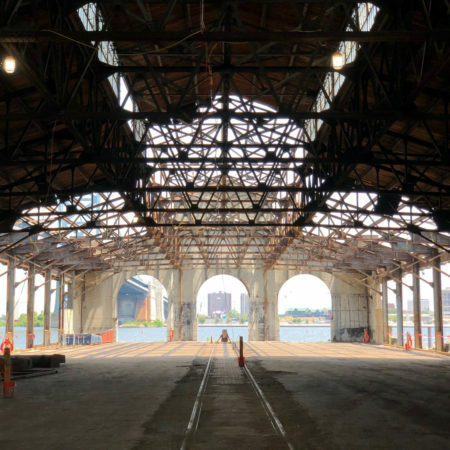 The 55,000 sf space was built to accept extremely large crafts at its side, but also as an intermodal transit point where goods were transferred from ship to rail. 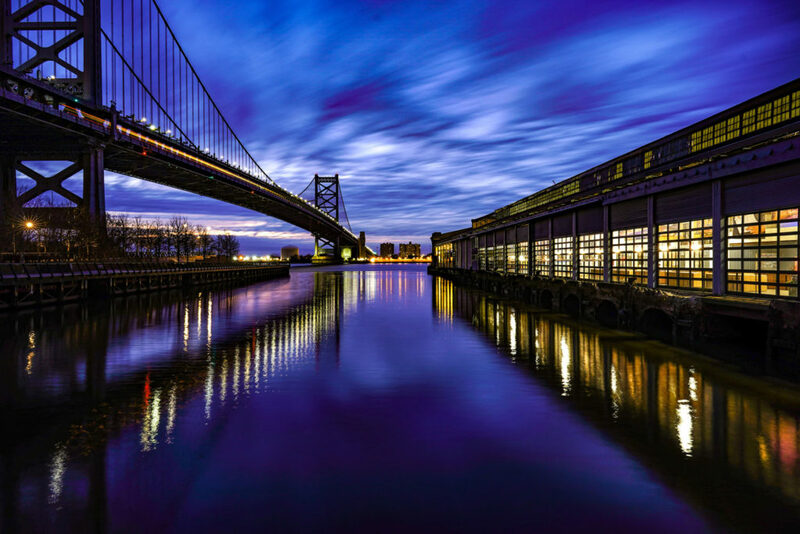 At the time of its construction, Pier 9 was the largest of Philadelphia’s 11 industrial waterfront piers. 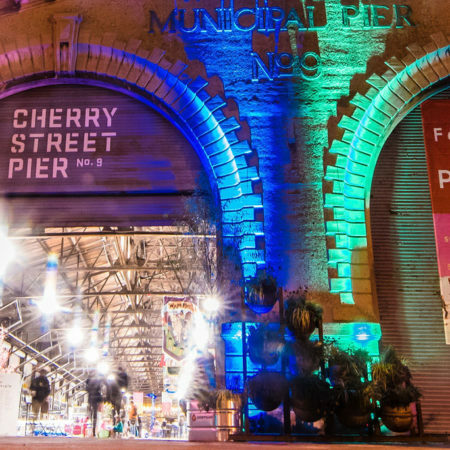 As was common at the time, the street-side entrance to the pier was an ornate concrete façade that aimed to conceal its industrial character. 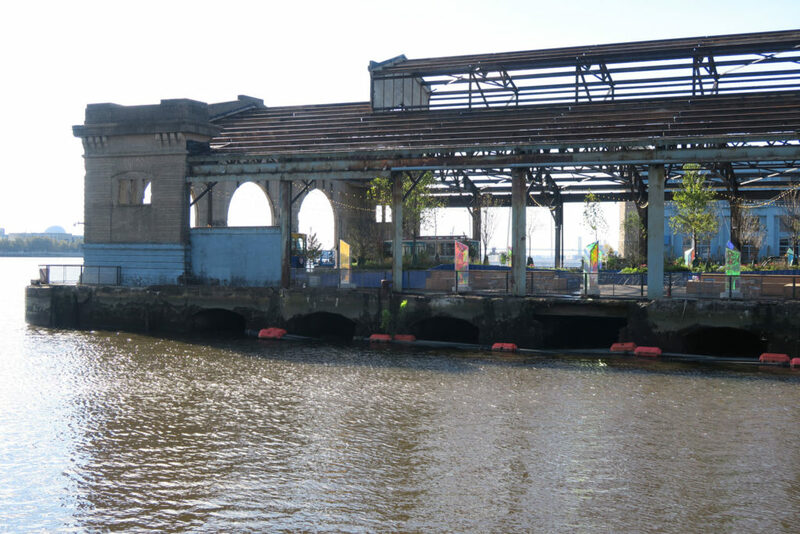 Abandoned for decades following the decline of industrial waterfront activity, and used as waterfront storage for many years, it is one of the few remaining examples of piers of its kind and the only one with its head house still standing. 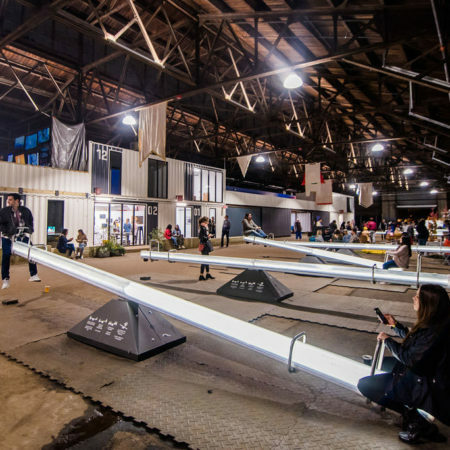 The pre-design site overflowed with intriguing, large-scale industrial relics that are fascinating to view and fun to interact with. 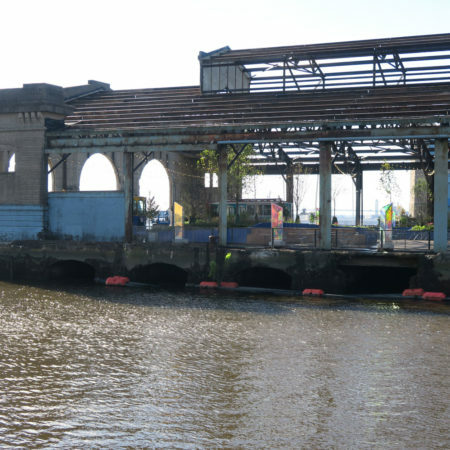 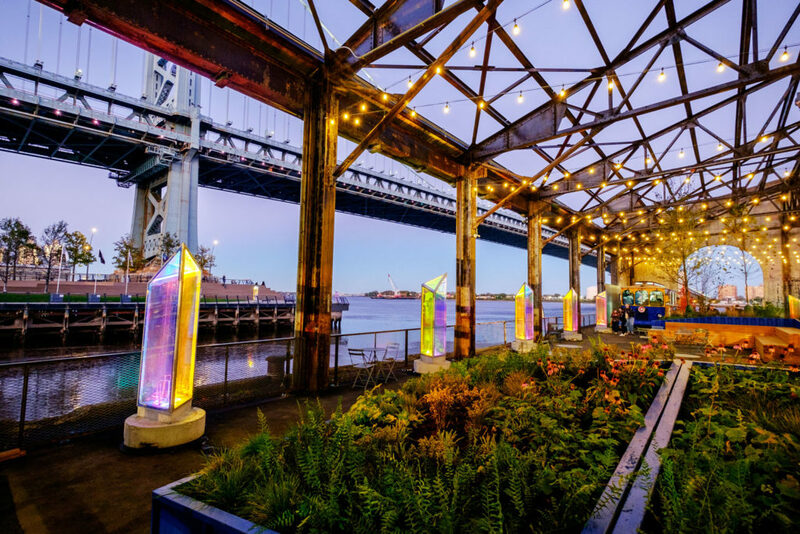 The design team went to great lengths to preserve these relics, wherever possible revealing and celebrating the pier’s former role as an import/export hub. 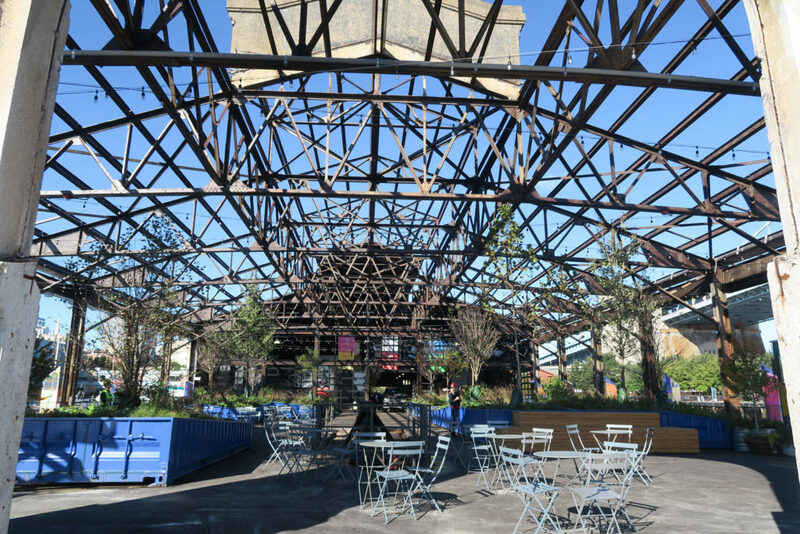 The dramatic rooftop superstructure was simply sealed and preserved to the greatest extent possible; at the riverfront garden area the roof is removed revealing only the dramatic skeleton of the former canopy. 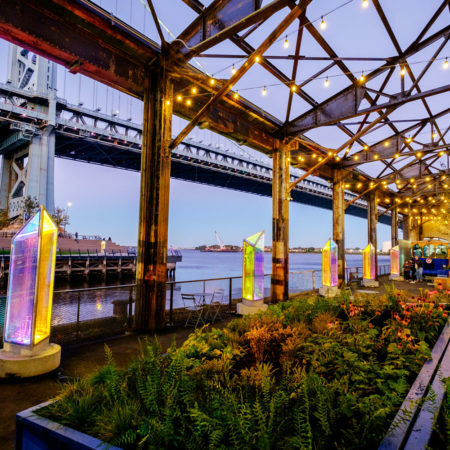 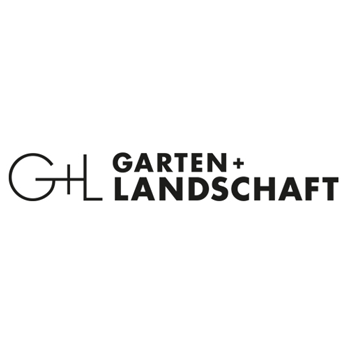 The rails that ran through the site and terminated in large steel rail stops, are exposed at portions of the garden’s edge along with the former brick pavers. 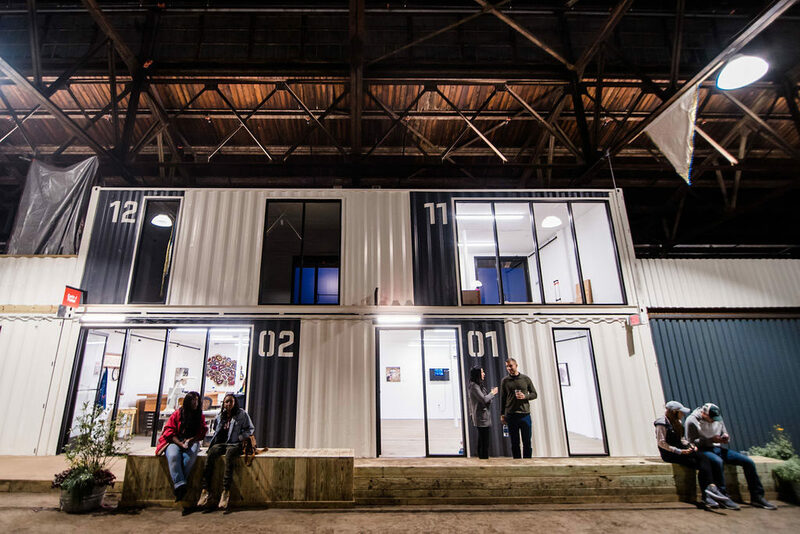 Near the shipping container studios, remnant cabling systems hang from the ceiling, adding to the space’s industrial charm. 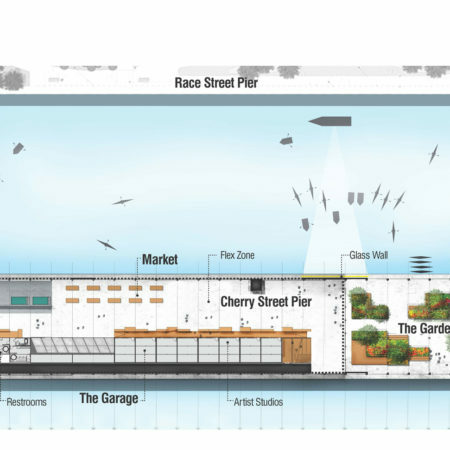 Cherry Street Pier is loosely designed as three spaces: the Market, the Garage and the Garden. 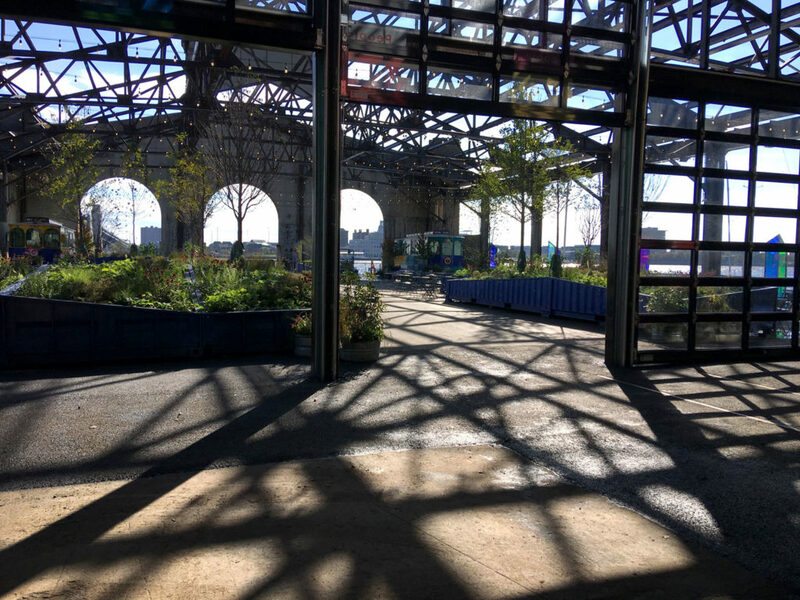 Together these spaces create a dynamic multi-use public space along the waterfront, a space that is uniquely Philly. 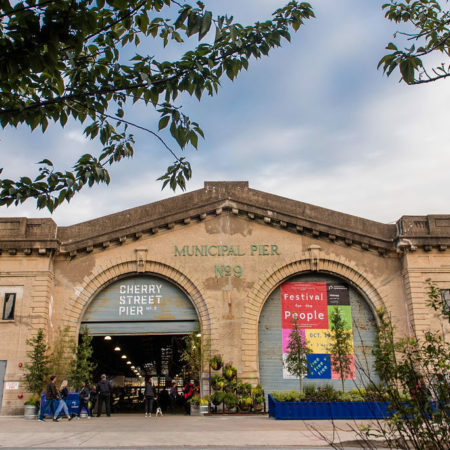 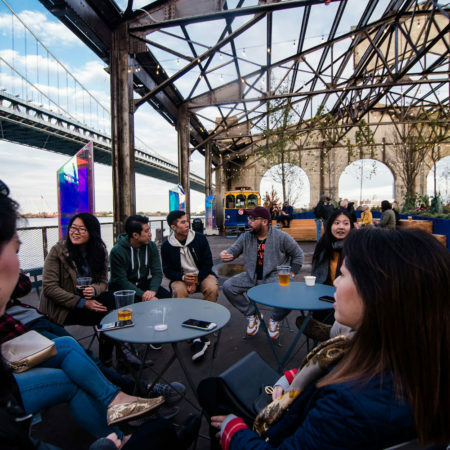 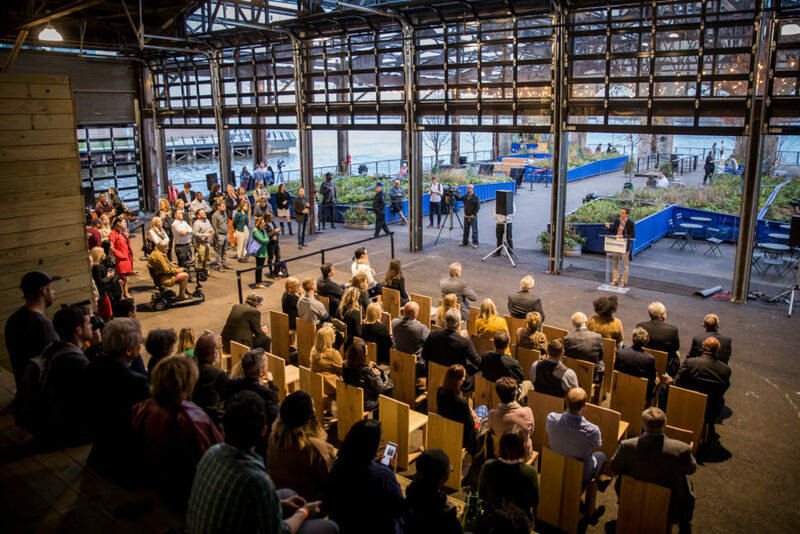 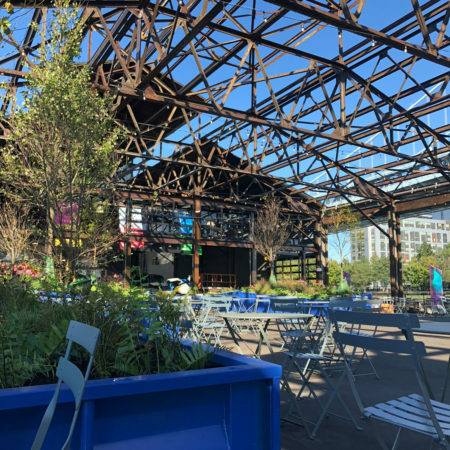 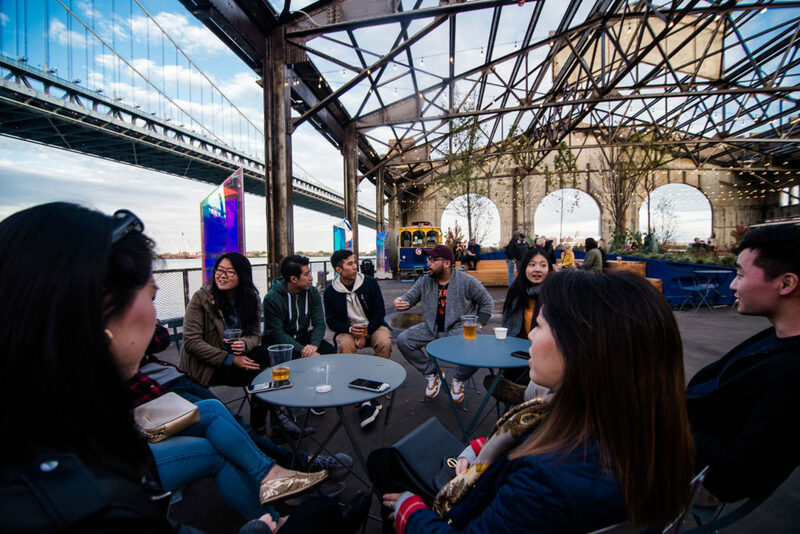 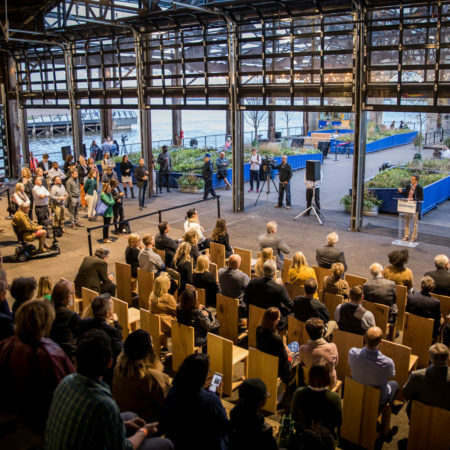 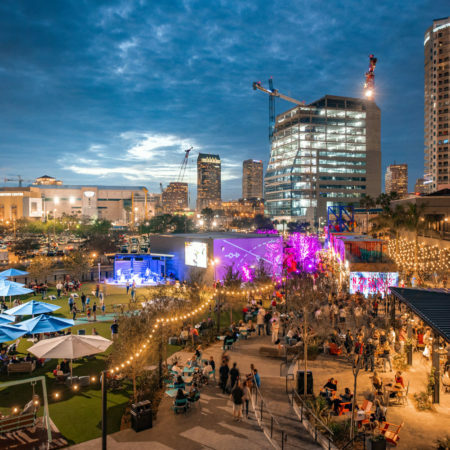 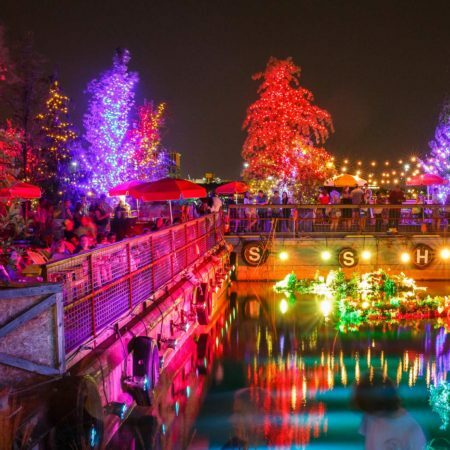 CSP is ideal for hosting large-scale events, having a quiet moment by the water’s edge, meeting a friend for a quick bite and being washed in the historic and creative inspiration of the space. 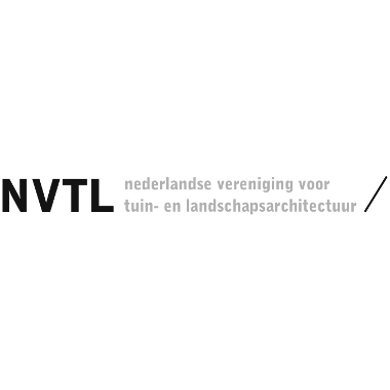 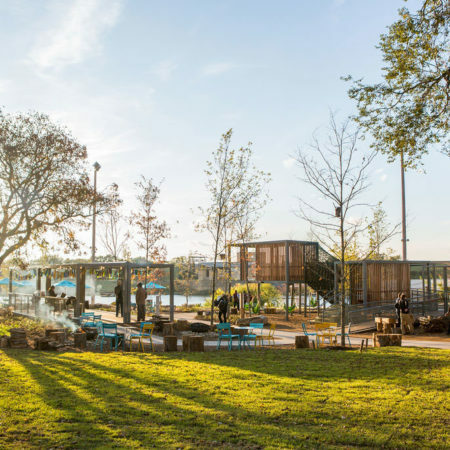 It is a public pier for the people, with a design whose flexibility allows for its regular transformation. 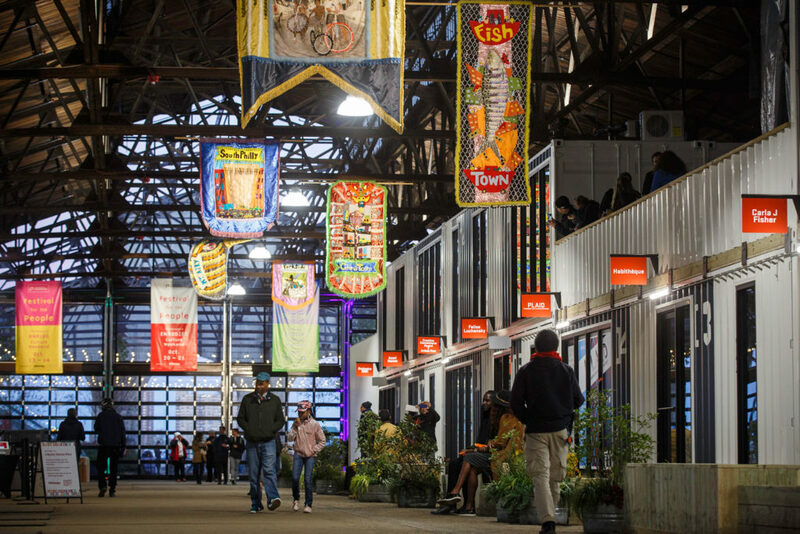 As you pass through the entrance of the preserved concrete façade, complete with baroque flourishes, you enter “the Market,” a vast yet enclosed space, dotted with art and furnishings and anchored by “the Garage” shipping container studios at the south side. 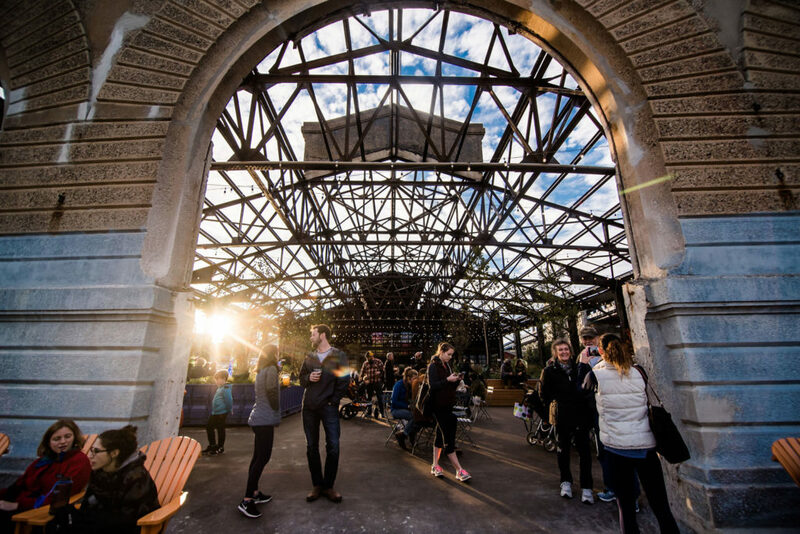 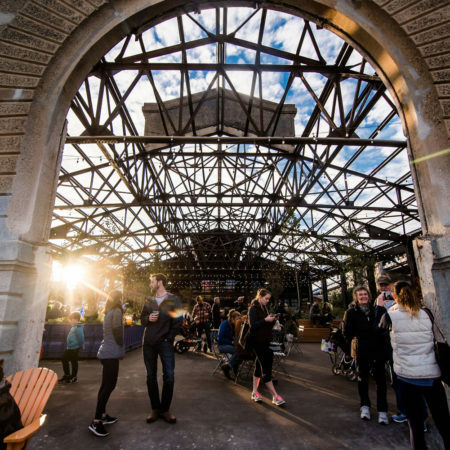 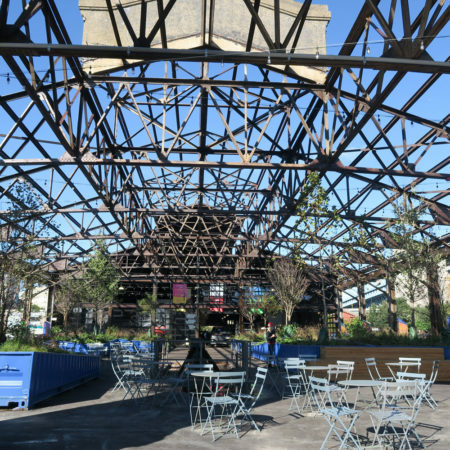 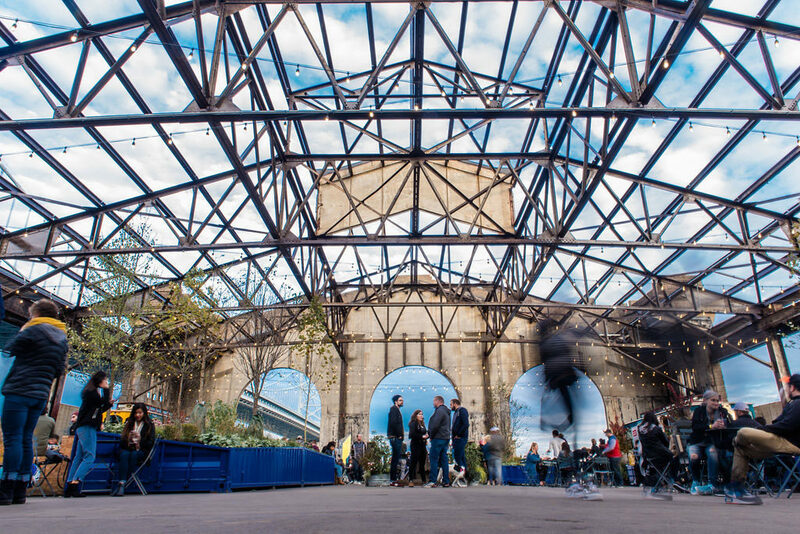 Underneath the shell of the preserved roof, this flexible space forms the backbone of the public programming with ample square footage for year-round markets, public art events/installations, concerts, and performances. 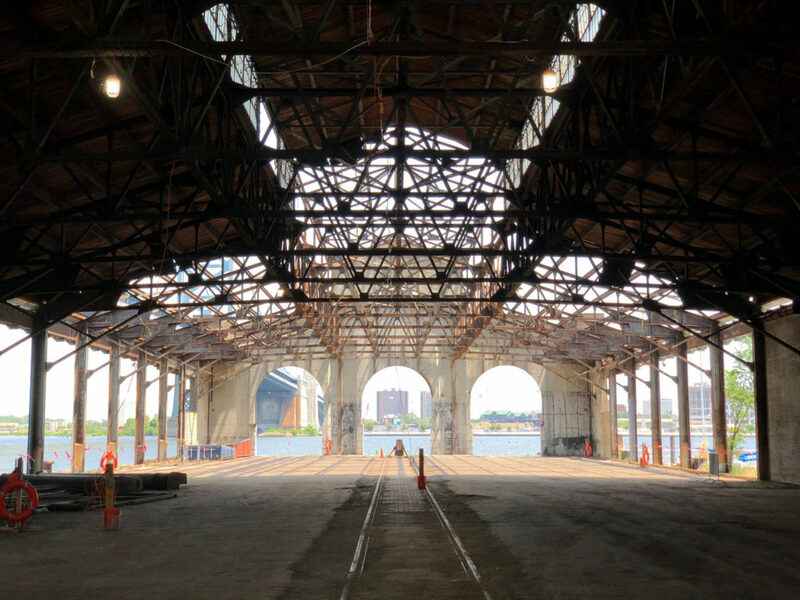 A refurbished bank of original windows at the shell’s north edge add industrial charm while creating a porosity with the exterior. 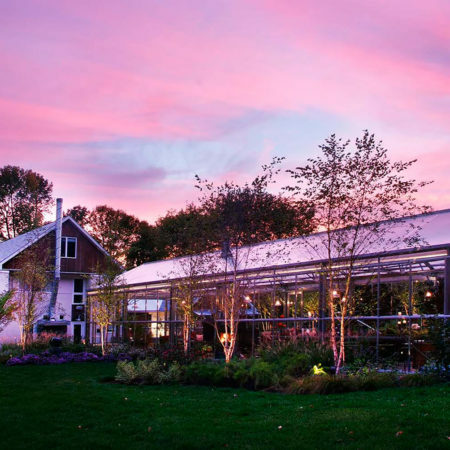 Original clerestory windows flush the space with even more natural daylight. 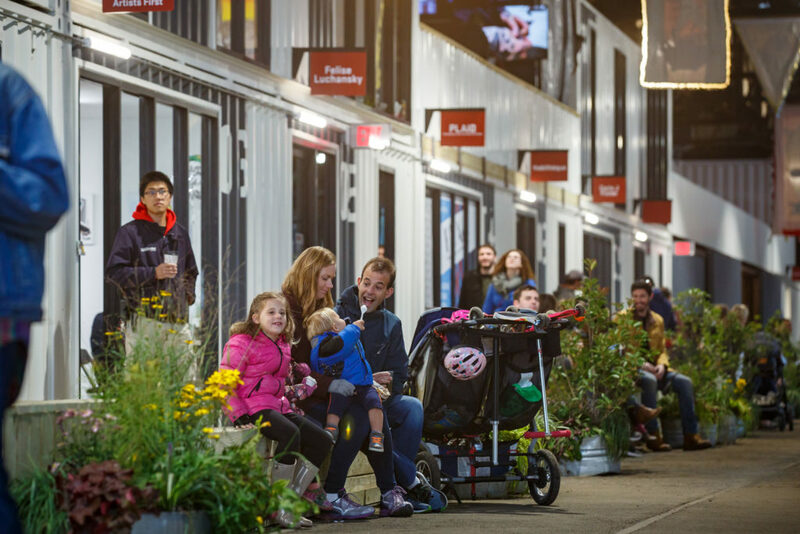 Roll-up garage doors open to maximize indoor/outdoor connections in agreeable weather and extend the usage opportunities during chillier months. 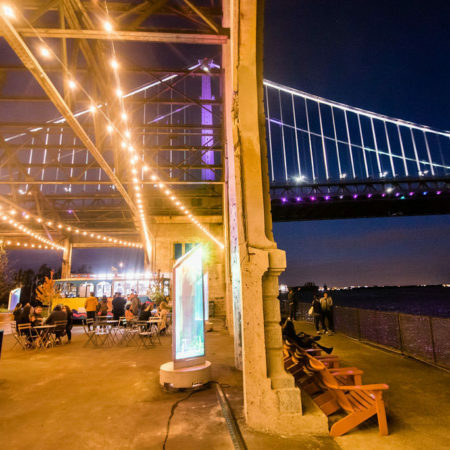 With the doors open, the northern wall essentially disappears, emphasizing relationships to the river and views of the Ben Franklin Bridge and CSP’s northerly neighbor, Race Street Pier. 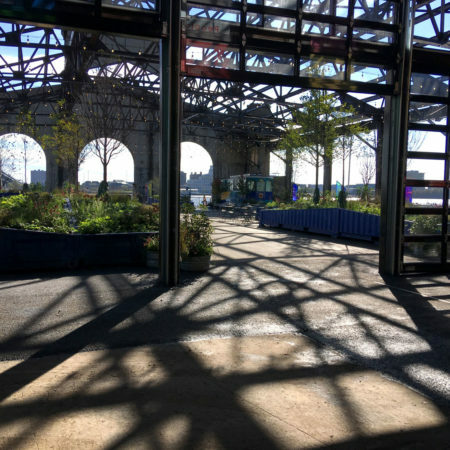 The enormous retractable glass doors at the riverside edge of the Market allow for the optional definition of a fully enclosed space, separate from the garden, while maintaining engaging views of the river. 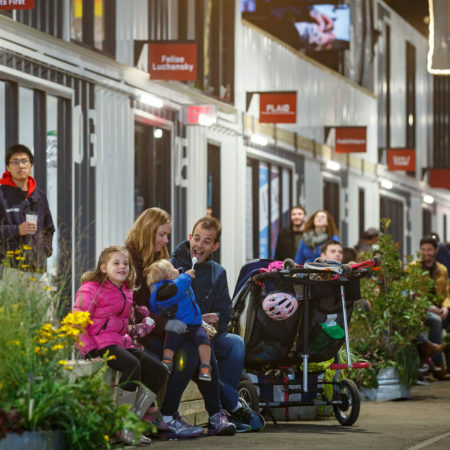 A colony of shipping container studios with glass facades flanks the southern edge of the interior space. 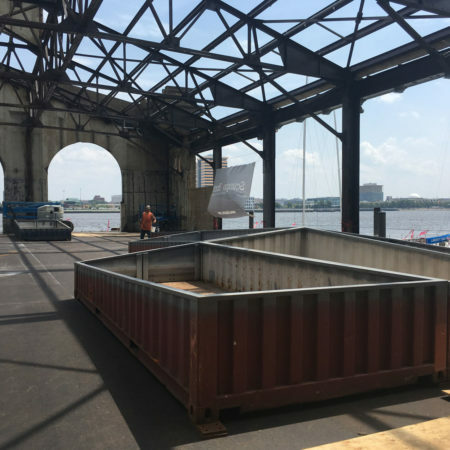 The shipping containers provide a historic nod to the pier’s previous life, as well as a connection to the Delaware River’s continued relevancy as a working, heavily used shipping channel. 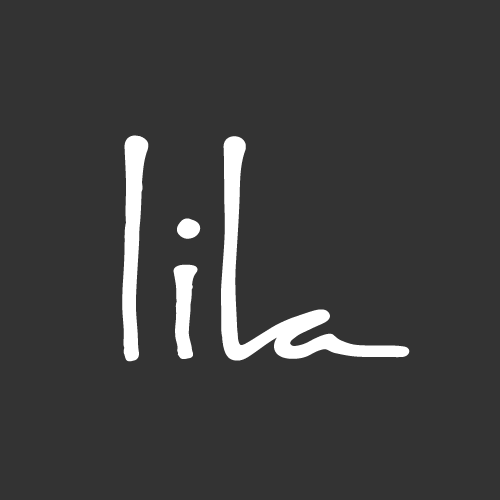 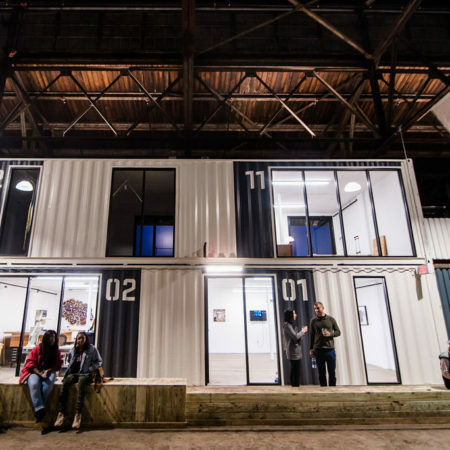 This creative arts incubator, an interior within an interior, houses rotating residencies for 14 working artists, makers and entrepreneurs as well as a co-working space. 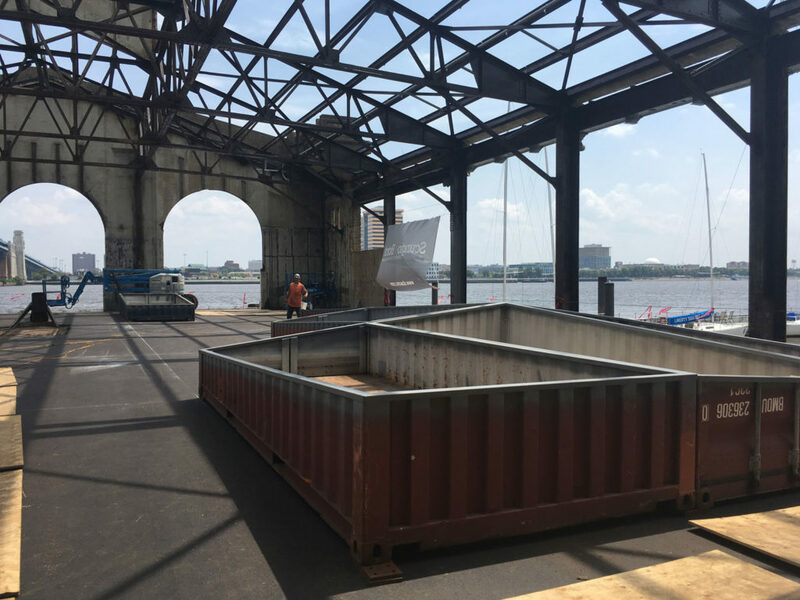 The glass facades of the containers put the artist-at-work on display for the public, inviting conversation or an engaging viewing experience. 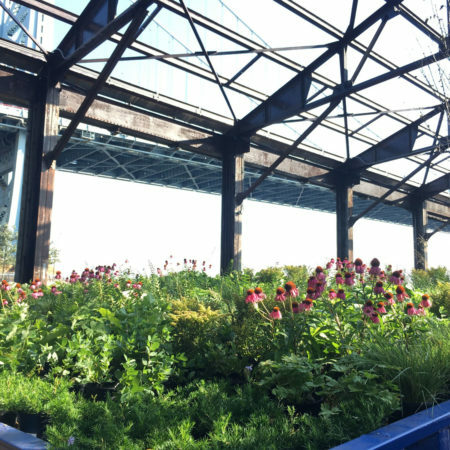 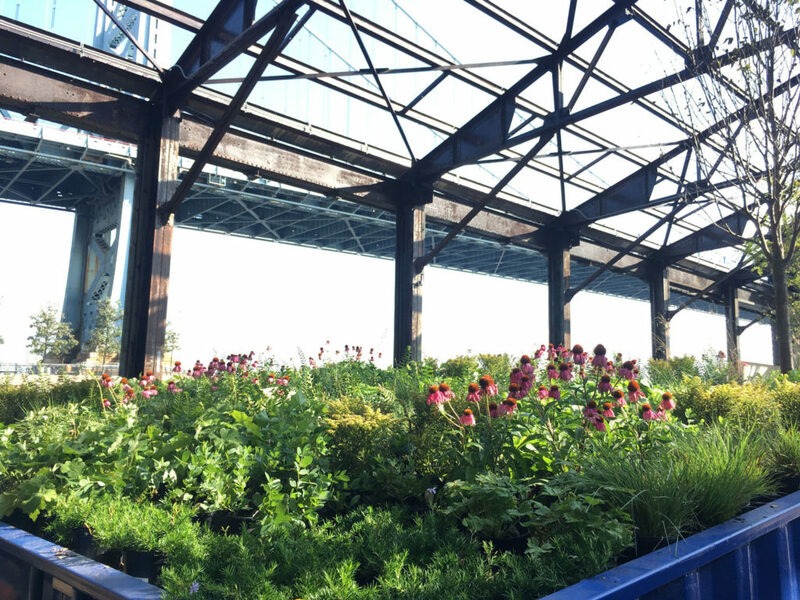 At the eastern edge of the pier that stretches farthest across the water, the shell of the roof superstructure is removed in the creation of an open-air garden. 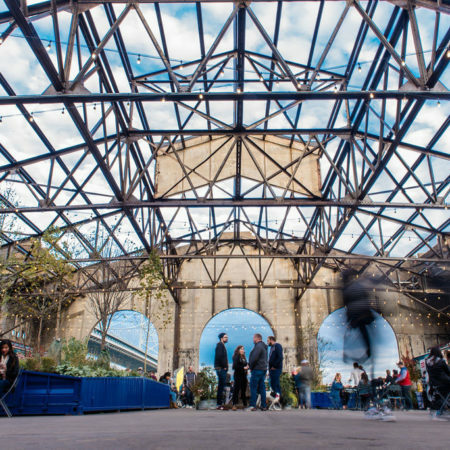 The intricate skeleton of the roof trusses remains overhead, forming an interesting porous canopy. 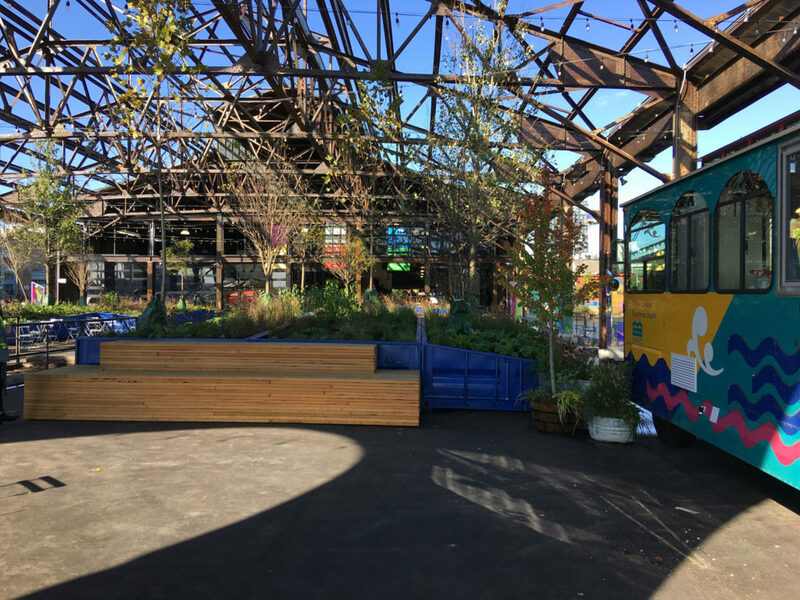 Large shipping containers cut on the vertical bias and stuffed with perennial native plants form the framework of the colorful space. Bright flexible furnishings allow the visitor to shape their own environment while vintage Philly trolley cars, retrofitted as incubator kitchens for local food and beverage options, allow visitors to enjoy a beer or a snack while they relax. 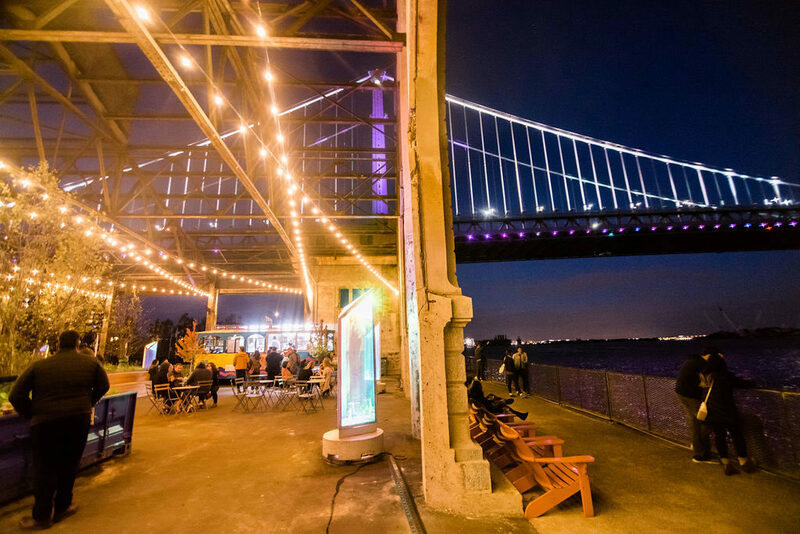 The concrete arches of the building’s preserved back façade artfully frame vistas of the Ben Franklin Bridge and the massive Delaware churning at the pier’s edge. 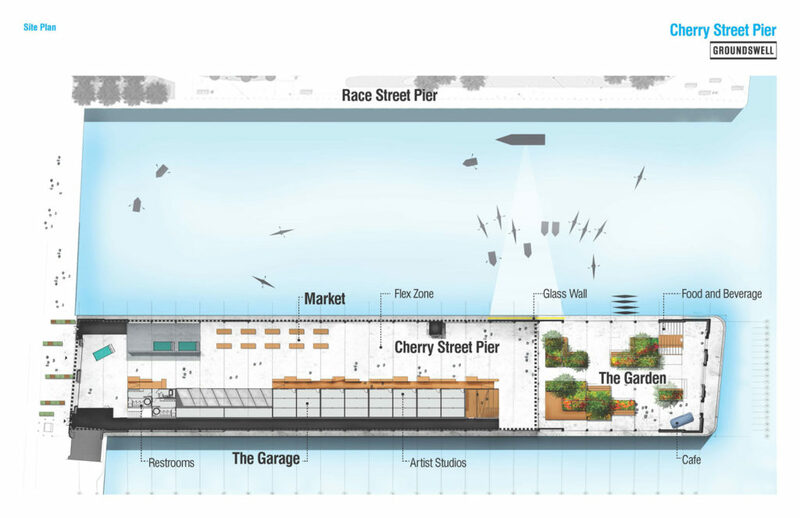 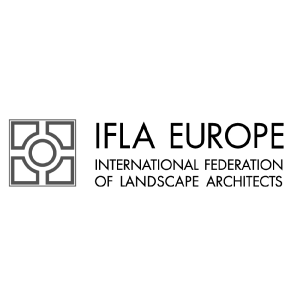 In the ideation of Cherry Street Pier, the designers set out to create a different kind of public space: one that is humble yet designed, that honors the past while inspiring the future and that engages the diverse local and regional communities in exciting and dynamic ways. 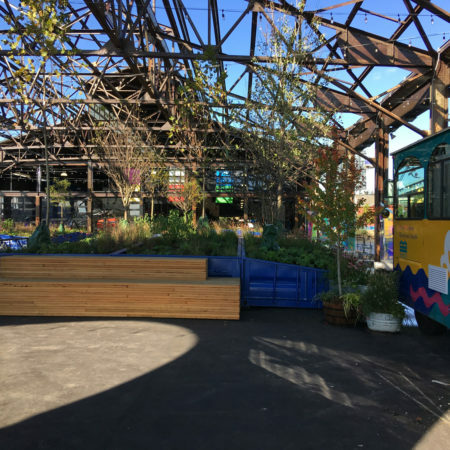 In addition to being a place where people recreate and have fun, the space aimed to foster economic opportunity, dialogue and connection. 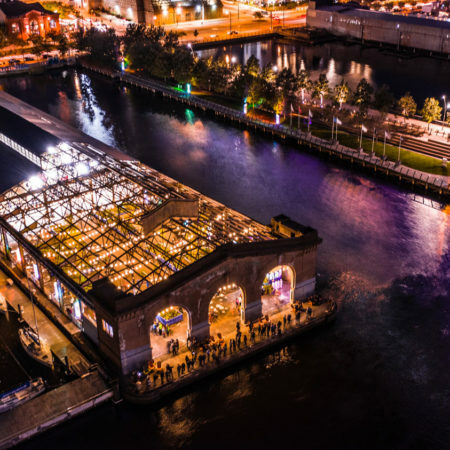 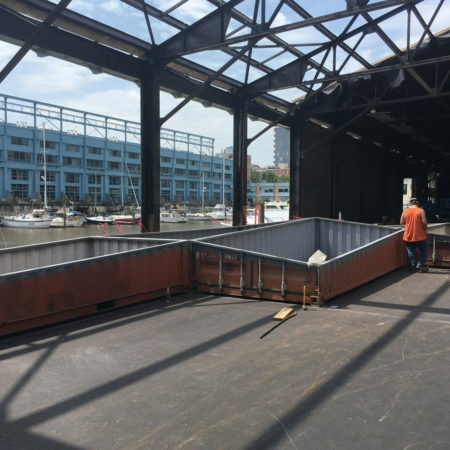 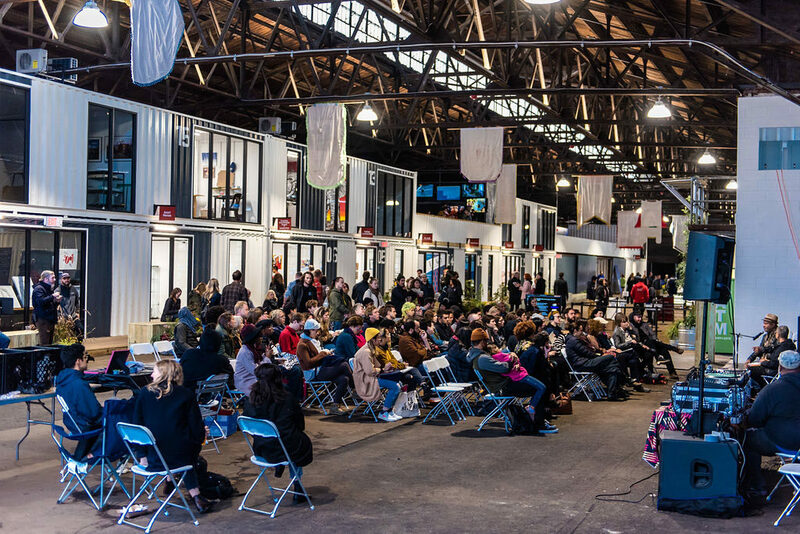 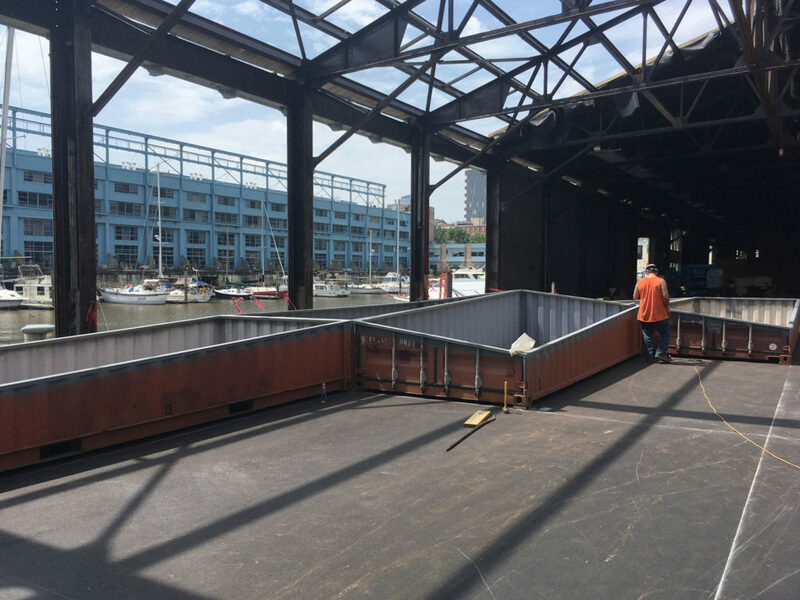 While the industrial character drove the pier’s design, the overall imperative was to create a space that is fun, functional, flexible and collaborative for artists and makers within greater Philadelphia.